One of my favorite things about Zink’s books will probably always be the mix of stunning writing with rich setting. Her books are addicting and enamoring, pulling me in so completely that I feel, every time, as if I am right there with the characters, in period clothing. 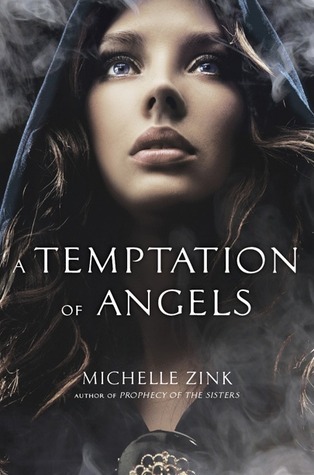 A Temptation of Angels is no exception, and with the stunning plot, this one is a total must read. Helen is, in many ways at the start, a girl typical of her period. Obedient and loving to her parents, and used to the relative oppression of women at the time, she stays within her bounds. Terrified when her mother wakes her in the night, rapidly packing a bag and hiding her away with explicit instructions to get out at all costs, Helen’s entire world is shattered and turned over. Forced rapidly to give up on life she is used to, Zink beautifully navigates the gap between dainty to strong and determined. While her change is forced by circumstance, Helen has it within her the entire time to stand up to everything she is facing, and not let anyone push her around in the process. This isn't a tale of a girl against her time period’s way of life, but rather a girl who simply has such fortitude that she can handle the rapid shift. Still, she has her moments of sorrow and weakness, and she will easily tug readers into her story. Helen goes through excellent growth, from learning about love to the truth of what she is, and handling all of it with a certain grace. Griffin and Darius are the pair of brothers who she’s instructed to go see, who take her in, however hesitantly. Though Darius is strong-minded and often rude to her, he is fiercely protectively and intelligent. He will easily grow on readers, and brings his own set of assets to the table. Zink writes him perfectly, the boy trying to take care of his younger brother and protect his own life as well, and the one who has learned the hard way to trust almost no one. He softens to some extent as things progress, and goes through his own sort of changes. Griffin is charming and sweet, a perfect love interest in large part for his ability to understand and see things through others eyes. Loyal to his brother, with a beautiful and strong dynamic between the two, Griffin has such a well rounded personality that readers will have no choice but to melt for him. The budding romance between Griffin and Helena is that quiet kind of steamy that comes with the time period, where even a touch is so meaningful, and I absolutely loved the way these two learn to balance their feelings for each other with what else is happening and what they must do. Then there’s the plot, with some beautifully woven elements and quite a bit of uniqueness to it. Set in no specified time period, but certainly historical, and hitting slightly into a steampunk type element with some of the tools used, Zink has created a type of story all her own, and done it masterfully. Vivid in setting, with beautifully written scenes and actions, this one will easily play out like a movie in reader’s minds, and setting them right beside Helene the entire time. The writing is stunning, saying so much in few words, and having a lulling air about it while also keeping with the tense and sorrowful emotional atmosphere that comes with the situations Helen finds herself in. This book is easy to get lost in, and memorable in many ways. I really enjoyed this book and am looking forward to the next one! I liked the somewhat vague time period, and the slow, yet satisfying romance between Helen and Griffin. Thanks for the review! I loved her trilogy and can't wait to read this one, she takes me on a visual journey, just lovely writing. Great review, can't wait, especially with a 5 star. You get the same stunning visual journey with this one, with all the emotions too. Nice blog. As a lover of books you might be interested in the word play involved in cryptic crosswords. I am doing a series of posts on solving cryptic clues. This was the first one I did. http://caroleschatter.blogspot.co.nz/2012/01/cryptic-crosswords-solving-hints-1.html Hope you enjoy.